We've been waiting for them. Now, it appears they have arrived. The first of what will likely be many (possibly hundreds) of military tribunals has begun. The tribunals commenced on January the 2nd, according to the Department of Defense, and these proceedings began with a case that could very easily unravel the provably false mainstream narrative of the September 11th attacks. Along with this news comes a new series of posts from Q Anon. 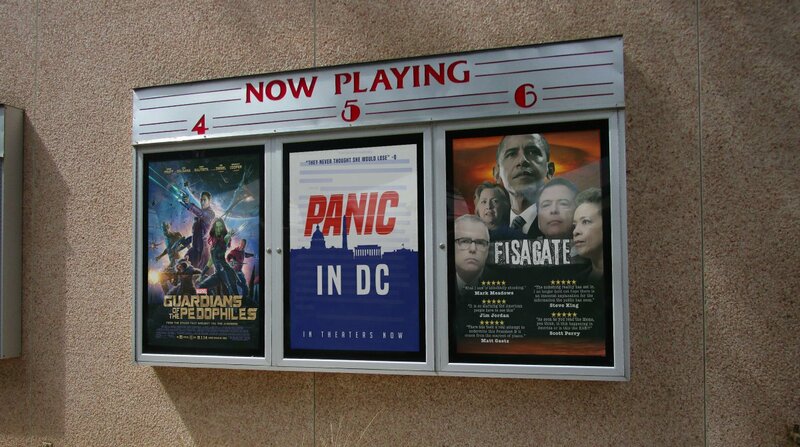 When we see the correlation between these sources of intel (those being QAnon.pub and the official D.O.D. website), it becomes clear that there is notable credibility and attention to informational accuracy included within the Q drops. These disclosures appear to be strategic in their timing and subject matter, and as we can see, the following post is no exception. 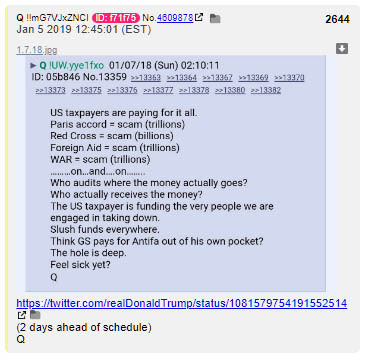 This post was made on January 5th (the day of the writing of this article) and according to the post, the itinerary of what many anticipated to be the Deep State take-down is ahead of schedule. We might remember one clever reference made by Q a number of weeks ago regarding a certain succession of significant events. This image (above) was posted by Q on November 4, 2018, and suggests that there is a specific order of events that were planned for three successive days. It was unclear whether or not these dates were intended to reference the month of January. However, after the above Q post was revealed, the date of January 4th makes sense. This would also explain the statement that the Q team and the patriots involved are now two days ahead of schedule. The events planned for the 4th ended up occurring on the 2nd (i.e., Guantanamo tribunals), and the events that follow may also be taking place earlier than anticipated. It seems that all of the reports about the preparations and massive construction operations at Guantanamo Bay were just as substantial as anticipated. However, it is still important that we remain attentive and avoid getting ahead of ourselves with regard to oncoming disclosures. We may wait in eager expectation to hear more recognizable names coming through the D.O.D. website fairly soon. Until then, it may be important to prepare for the anticipated public reaction to these revelations. It has been predicted that many of those who have chosen to blindly default to mainstream propaganda may panic upon hearing the truths which come forward during these tribunals. These mainstream fanatics might believe that the world is ending when they see the opposite of many of the MSM narratives proving to be true. This may require each of those who have done their research and are able to articulate their knowledge of these events to be available to explain these details to their friends, family, neighbors, etc. as events progress. This means that many of us need to come out of the conspiratorial closet in making this information public with those who may not be aware of it. By doing this, we can help to ease the shock which the public will likely experience if/when they see their once-admired public figures facing a military tribunal. It is recommended that we only present information that can be officially substantiated (at least initially). It may also be a wise course of action to gain a working understanding of these matters so that if we are questioned on any issue, we can easily give a helpful answer or at least point people to the information they are seeking. There will most likely be much more on these subjects to report. I will do my best to be prompt in delivering this information as soon as it becomes available to me. The Department of Defense and the Office of Military Commissions will allocate seats for news media aboard military-chartered aircraft for travel from Joint Base Andrews to Naval Station Guantanamo Bay to cover military commission pre-trial proceedings scheduled for United States v. Khalid Shaikh Mohammad et al., Jan 28 to Feb. 1. 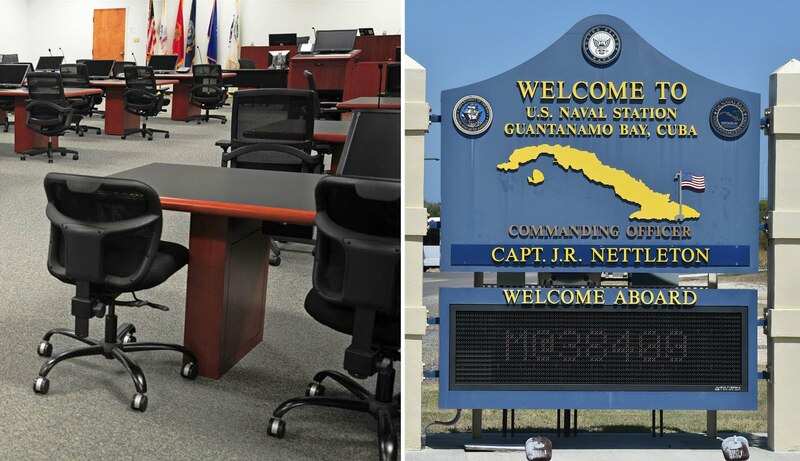 Media desiring to view this hearing from either Guantanamo Bay or Fort Meade should send their requests via email to osd.pentagon.pa.mbx.gtmo-press@mail.mil. All requests must be received no later than 5:00 PM (EDT), Monday, Jan. 7.